Click on Tools, then Email Accounts. 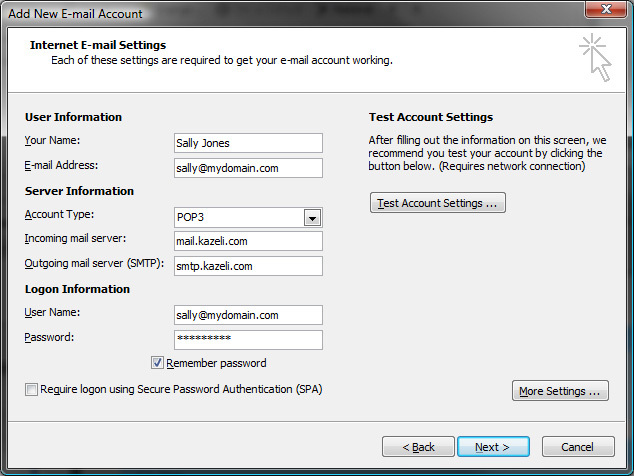 By default, the wizard will auto select View or Change existing email accounts. Click Next. Choose POP3 as the Server Type. 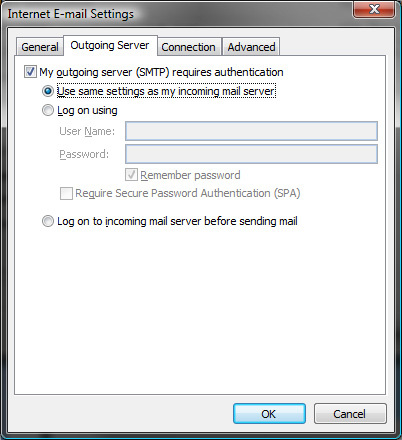 Click MORE SETTINGS and click the OUTGOING SERVER tab and select “Use same settings as my incoming mail server”. Click OK.
correctly. Fix and test again. My outgoing connection has failed. What’s next? If you have followed the instructions perfectly as above and have selected the option “My outgoing mailserver requires authentication” and still you are not able to connect to our mailserver, then most likely your Internet Service Provider (ISP) is not allowing this. In this case you will need to un-check the option “My outgoing mailserver requires authentication” and change the outgoing mailserver to your ISPs. Usually you can find out this information by visiting their website or calling their support line.